Background: Homeless mentally ill (HMI) patients pose a major problem in our society. There are no specific, focused studies to understand the complex needs and the challenges faced by state and society in providing care of HMI patients in India. Objectives: This study was planned to understand the challenges faced by state and society in providing care to HMI. Materials and Methods: We performed a retrospective chart review of “HMI” patients from January 1, 2002, to December 31, 2015, who were admitted to the Department of Psychiatry at National Institute of Mental Health and Neuro Sciences, Bengaluru, India. Pathway to care and reintegration outcome characteristics were analyzed using descriptive statistics. Results: In our study, among 78 HMI patients admitted, police 32 (41%), public 32 (41%), and nongovernmental organizations (NGOs) 14 (18%) were the first contacts who found HMI patients. In the 15 weeks of mean duration of inpatient care, 40 (51.3%) were reintegrated into the family through a multidisciplinary approach. However public, NGO, Clinicians had multiple challenges in admission, treatment services, rehabilitation, and aftercare of HMI patients. Conclusion: Holistic care and services for HMI patients are challenging and have multiple hurdles with the existing infrastructure in India. Better care might be possible with collaborative, multidisciplinary approach with NGOs, Rehabilitation centers, local police, judiciary, and psychiatric facilities. Mental Health Care Act 2017 has addressed above few challenges making admission procedure simpler, administering free treatment, involving police officers in the identification of HMI, admission to hospital, tracing HMI, and reintegration with the family. Homeless mentally ill (HMI) patients represent a unique problem in developing countries like India., There is a dearth of knowledge on prevalence, services delivered, and the pathway to care of HMI patients in India. The National Mental Health Survey of India – 2016, guesstimates the range from “NIL” or “almost minimal” to “1% of mentally ill” to as high as “15,000.” HMI suffer from schizophrenia; substance use disorder, and Mental Retardation in general. They are often found around railway stations, bus stands, pilgrim centers, beggar's home/colony, urban/rural areas, and on the street corners of metro cities.,,,, The Mental Health Act of India, 1987 has provisions for the admission, treatment, and detention of wandering HMI patients under reception order through police or parens patriae power.,, Despite this, services and provisions remain limited, and the majority of the HMI patients do not have adequate access to mental health facilities., This issue becomes more important in the background of The Mental Health Care Act of 2017 (MHCA - 2017) and National Mental Health Policy of 2014., Both of which mandate government to come up with dedicated services for such people. Pathways to care is one of the ways to understand the mental health services used, identification of the services, delay in services, and to find the alternatives.,,,,, There are many studies, which have looked into the pathway to care for mentally ill persons staying with caregivers. However, to the best of our knowledge, there are no existing studies on the pathway to care for HMI patients from India.,,,,, In this background, this study aims to explore the pathway to care adopted by the state, society, and its complexity in bringing the patient to healthcare and reintegration of HMI. This study also aims to study the challenges faced by state and society in providing care to HMI patients. This, in turn, may help the policymakers to make an efficient system and guidelines for providing long-term care of HMI patients. The study was conducted in the Department of Psychiatry, National Institute of Mental Health and Neuro Sciences (NIMHANS), Bengaluru, India. It is a tertiary care center and one of the largest mental health facilities in south India. Most of the patients who visit the facility are from south India (Kerala, Tamil Nadu, Andhra Pradesh, and Telangana) along with referrals from other parts of the country. Our closed ward facilities have a bed strength ranging from 50 to 60 beds separately for different genders and cater the needs of unknown (HMI) people. For the purpose of this paper, data are derived from a larger study on “unknown” patients from the “know the unknown” project. “Unknown” was operationally defined as HMI patients, who do not have any identity at the time of admission. The details about “know the unknown” project and unknown (HMI) patient's selection are provided elsewhere. A total of (n = 78) “unknown” patients were admitted from January 1, 2002, to December 31, 2015. The multidisciplinary team in emergency care collect relevant information about “unknown” from the person who brought the patient to the hospital regarding where she/he was found, how she/he was found and what were the behavioral problems observed. History, identification and injury marks were documented. The multidisciplinary team and the person who bought the patient tries to identify the unknown patient by checking pockets of the shirt or trouser for identity cards, mobile numbers, aadhar cards or any other proof of identity. At times, the pendants worn by the patient and the tattoos on the body helps in identifying the cultural and religious background. As per our clinical experiences, 70%–80% of the families were traceable during the emergency care and rest of them get admitted as unknown. As soon as the patient's name and other personal details are confirmed, data in the system would be changed and the old registration number will be continued. Changes in the data will be done by the medical record personnel both in electronic and paper case records. All the unknown patients are registered as medico-legal case (MLC). Detailed general and neurological clinical evaluations were done. Routine laboratory investigations such as renal function test, liver function test, serum electrolytes, blood sugar, hemogram, and neuroimaging (computed tomography brain) were done on an emergency basis to all of them. Few patients who required another set of investigations such as HIV, venereal disease research laboratory, hepatitis-B surface antigen, urine for poly-drug, X-ray, etc., were done based on a case-to-case basis. In inpatient care, clinician did serial ward observations, behavioral, and mental status examination (MSE). Mental illness was diagnosed as per Internationational Classification of Diseases - 10. Some patients required other sets of assessments such as intelligence tests and diagnostic psychometry. Patients' clinical improvement was assessed on clinical global impression scale for severity and global improvement. In our study, we consider family reintegration as the return of the HMI patients to the family of origin after completing the treatment at the hospital level. As a team, we made our best effort to send them back to their families. Our multidisciplinary team approached each HMI patients after the improvement in the clinical status, but intellectual disability and symptom severity were major obstacles in collecting family details and native addresses. We asked open-ended questions, about who they are, where they are from, do they know anybody in the vicinity, which is nearest police station/post office to their home, any contact number they know, and family address. Information is reconfirmed with serial MSEs and cross-checked using Google Maps and other online resources about the existence of such place and address. Once the contact was established, these families were reassured, psychoeducated about the illness, discussed with issues surrounding family support and future care. The HMI patients were then sent home. Patients, where their family reintegration was not possible, were sent to state government-run women's welfare organization, rehabilitation center run by nongovernmental organization (NGOs) across the country based on language/place/diagnosis or they have stayed back at the closed ward. A structured data extraction tool was used in accordance with the study protocol, covering multiple dimensions: Sociodemographic profile, the pathway to care, clinical profile, psychosocial interventions, discharge, and follow-ups. All the obtained information has been used solely for the purpose of research with anonymity being maintained. The sociodemographic, clinical profiles, outcome, psychosocial interventions used, discharge, and follow-up findings of HMI patients are published elsewhere., In this paper, challenges faced by state and society in providing care and reintegration of HMI patients have been discussed. Institutional Ethical Committee of NIMHANS, Bengaluru, India, has approved “Know the Unknown” project. The paths taken by individual patients were brought together to produce a “Pathway to Care.” The number of patients taking each step on the pathways was mapped onto the diagram. Pathway to care and reintegration outcome characteristics were analyzed using descriptive statistics. Our study focuses on the HMI patient's pathway to the mental health facilities, reintegration into the society and challenges faced by state and society in providing care to HMI patients. To the best of our knowledge, there are no such studies till date in India, and this is the first empirical data. In our study, 78 HMI patients were admitted for treatment and rehabilitation, and among them, 42 (53.8%) were females and 74 (94.9%) patients were registered under MLC. 51 (65.4%) HMI patients were diagnosed with schizophrenia and other psychotic disorders, 24 (30.8%) with mental retardation and 23 (29.5%) with comorbid substance use disorder. [Figure 1] shows the different paths used by HMI patients to reach the tertiary neuropsychiatric hospital. The police 32 (41%), public 32 (41%), and NGOs 14 (18%) were the first contacts who found HMI patients. The public 14 (18%) and NGOs 8 (10.2%) had taken HMI patients to the police. The police 40 (51.2%), NGOs 8 (10.2%), and public 5 (6.4%) had taken HMI patients to the court to get a reception order. Even though public and NGOs initiated the care, most of the time patients were taken to police and reached the hospital for admission and care only after subsequent visit to the court for reception order. 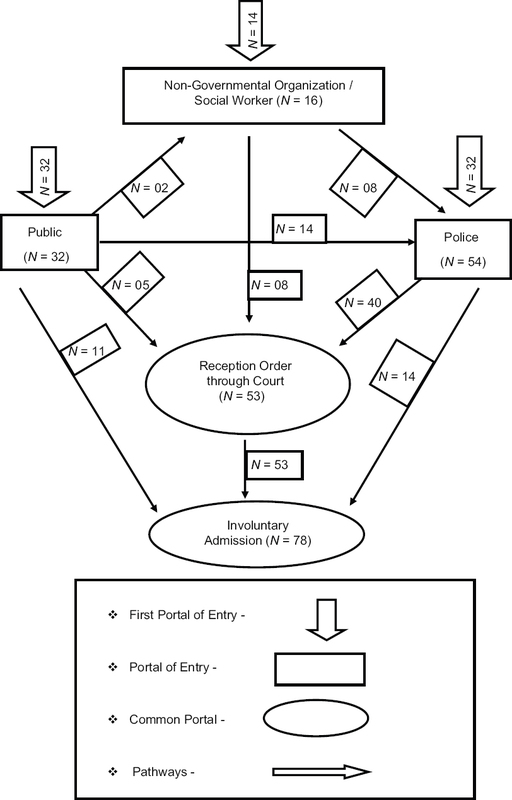 The healthcare process for admission of HMI patients is lengthier and have multiple hurdles and challenges for the public and state such as (a) guardianship of the patient, (b) paying hospital charges, (c) registering a MLC, (d) written letter from public about public nuisance and other problems created by HMI in their vicinity, (e) transportation issues due to behavioural problems, (f) stigma associated with HMI patients, (g) stigma associated with bringing to mental hospital, (h) stress and loss of pay during the care and bringing of HMI patients to hospital, and (i) meeting police and getting a reception order from the court. These are the hurdles, apart from the medical care. These findings are consistent with past two Indian studies on HMI patients., The new MHCA - 2017, has made procedure of admission and care of HMI patients procedure simpler and made it mandatory for officer-in-charge of the local police station to make a First Information Report of HMI patients, to take him to public health establishment, and to help the clinician in tracing the family and it has also reduced the burden on public and NGOs (Sec - 100, MHCA - 2017). As per Mental Health Act of 1987, getting reception order was more difficult and complex regarding the procedure with the involvement of police, clinician, and letter from friends/family which was expressed in our study by the public, NGOs, and Police. As per the newer Act, the magistrate can authorize the admission of the HMI patients in a mental health establishment for a maximum of 10 days. Afterward, it is the duty of medical officer-in-charge/psychiatrist/mental health professional of the public health establishment to decide about further admission, free treatment and care. This may improve the admission rate of HMI patients in Public Health Establishment (Sec - 102, MHCA - 2017). 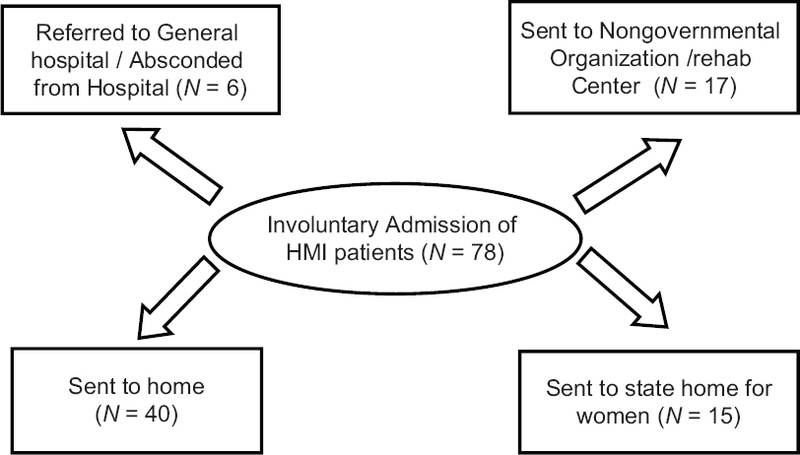 Even though thousands of wandering HMI patients are there in the city at any given point in time, all of them do not reach hospital due to the following probable reasons (a) procedure of admission to hospital being too tedious for public and NGOs as described above, (b) most of the HMI patients were not disturbing the society or state, (c) lack of awareness or reduced awareness about availability of care and treatment services in the state to the public and community, and (d) lack of awareness or reduced awareness about presence of mental illness among homeless people in the community. [Figure 2] shows the pathways to the reintegration of HMI patients. 40 (51.3%) were reintegrated into the family; 15 (19.2%) were sent to a state home for women, 17 (21.8%) were sent to NGOs/Rehabilitation Centre, and the rest 6 (7.69%) were either referred to a general hospital or absconded from the center. All the HMI patients are commonly cared by state-run government hospitals through reception orders. The clinicians who work in a government hospital will have many challenges and hurdles with respect to treatment, care, discharge, and rehabilitation. Common hurdles faced by the state in the care of these patients are (a) what is that the hospital needs to do? (b) when should the clinical decisions be made? (c) Consent for treatment and procedure, (d) what is the best approach to management? (e) what kind of finances and insurances does he or she has? (f) who will pay the hospital charges? (g) when to discharge from the hospital?, (h) where to discharge these patients? (i) What will happen after discharge? (j) who will monitor drug adherence? (k) Who will bring to the hospital for follow up? (l) where will the aftercare facility be available?, (m) who will pay for aftercare for rehabilitation? (n) how to enable social welfare benefits to HMI patients? and (o) who will fight and protect the rights of HMI patient after discharge? Newer MHCA - 2017 has addressed few issue raised by the clinician during care of HMI patients and given clarity about care-like free treatment and care in the free treatment and care by a duty of medical officer-in-charge/psychiatrist/mental health professional (Sec - 100, MHCA - 2017). It also has made government responsible to open homeless establishments and community-based facilities in the state or country. It upholds the fundamental rights, right to community living of every HMI patients (Sec - 19, MHCA - 2017). Even though many hurdles and challenges were there for state and society from admission, discharge and rehabilitation of HMI patients, most of the HMI patients improved; were discharged and in the majority of the cases, we were able to reintegrate them into their families. The treatment and rehabilitation outcomes are encouraging and promising to clinicians, policymakers, and other stakeholders. These findings will support the public, clinician, and policymakers to take a proactive step in mobilizing resources to take care of this special group and reduce the prevalence. The study was done only in the hospital-based sample and cannot be generalized to any other sample of homeless people with mental illness in the community. This study shows challenges faced by the public, NGOs and clinician in admission, care, treatment services, rehabilitation, and aftercare of HMI patients in public health establishment of south India. The MHCA - 2017 has addressed few issues which were not covered by the older Mental Health Act - 1987 like making admission procedure simpler without the need of reception order for detention and care, free treatment, involving police officer in the identification of HMI patients, admission, tracing HMI patients, and reintegration. It also discusses HMI patient's right to community treatment, liberty, dignity, health, and stay in the community. However, there are workforce, infrastructure, and resource difficulties in the implementation of the MHCA - 2017 throughout the country in providing holistic care. Gowda GS, Gopika G, Manjunatha N, Kumar CN, Yadav R, Srinivas D, et al. Sociodemographic and clinical profiles of homeless mentally ill admitted in mental health institute of South India: 'Know the Unknown' project. Int J Soc Psychiatry 2017;63:525-31. Gowda GS, Gopika G, Kumar CN, Manjunatha N, Yadav R, Srinivas D, et al. Clinical outcome and rehabilitation of homeless mentally ill patients admitted in mental health institute of South India: “Know the Unknown” project. Asian J Psychiatr 2017;30:49-53. Singh G, Shah N, Mehta R. The clinical presentation and outcome of the institutionalized wandering mentally ill in India. J Clin Diagn Res 2016;10:VC13-6. Tripathi A, Nischal A, Dalal PK, Agarwal V, Agarwal M, Trivedi JK, et al. Sociodemographic and clinical profile of homeless mentally ill inpatients in a North Indian medical university. Asian J Psychiatr 2013;6:404-9. National Mental Health Survey of India, Supported by Ministry of Health and Family Welfare Government of India; 2015–16. Available from: http://www.nimhans.ac.in/sites/default/files/u197/ NMHSReport(Prevalencepatternsand outcomes)1.pdf. [Last retrieved on 2017 Nov 01]. Gowda GS, Noorthoorn EO, Kumar CN, Nanjegowda RB, Math SB. Clinical correlates and predictors of perceived coercion among psychiatric inpatients: A prospective pilot study. Asian J Psychiatr 2016;22:34-40. Testa M, West SG. Civil commitment in the United States. Psychiatry (Edgmont) 2010;7:30-40. The Mental Health Act, 1987 – Ministry of Health & Family Welfare Department, Government. of India. Available from: http://www.wbhealth.gov.in/download/MENTAL%20HEALTH%20ACT%201987.pdf. [Last retrieved on 2017 Feb 20]. Thara R, Patel V. Role of non-governmental organizations in mental health in India. Indian J Psychiatry 2010;52:S389-95. The Mental Health Care Act, 2017 – Ministry of Health & Family Welfare Department, Government of India. Available from: http://www.prsindia.org/uploads/media/Mental%20Health/Mental%20Healthcare%20Act,%202017.pdf. [Last retrieved on 2017 Nov 01]. National Mental Health Policy (NMHP) of India 2014, Government of India; 2017. Available from: http://www.mohfw.nic.in/WriteReadData/l892s/9903463892NMHP%20detail.pdf. [Last retrieved on 2017 Feb 20]. Fazel S, Geddes JR, Kushel M. The health of homeless people in high-income countries: Descriptive epidemiology, health consequences, and clinical and policy recommendations. Lancet 2014;384:1529-40. Fazel S, Khosla V, Doll H, Geddes J. The prevalence of mental disorders among the homeless in western countries: Systematic review and meta-regression analysis. PLoS Med 2008;5:e225. Freedman S, Desai NG, Shivalkar R, Kaur P, Gajendragad JM, Kumar S, et al. Situation Analysis of Mental Health and Psychosocial Aspects; 2008. Available from: http://www. homelesspeople.in/report_pdf/4.pdf. [Last retrieved on 2017 Nov 01]. Thompson RG Jr., Wall MM, Greenstein E, Grant BF, Hasin DS. Substance-use disorders and poverty as prospective predictors of first-time homelessness in the United States. Am J Public Health 2013;103 Suppl 2:S282-8. Ibrahim A, Hor S, Bahar OS, Dwomoh D, McKay MM, Esena RK, et al. Pathways to psychiatric care for mental disorders: A retrospective study of patients seeking mental health services at a public psychiatric facility in Ghana. Int J Ment Health Syst 2016;10:63. Faizan S, Raveesh B, Ravindra L, Sharath K. Pathways to psychiatric care in South India and their socio-demographic and attitudinal correlates. BMC Proc 2012;6 Suppl 4:P13. Rogler LH, Cortes DE. Help-seeking pathways: A unifying concept in mental health care. Am J Psychiatry 1993;150:554-61. Adeosun II, Adegbohun AA, Adewumi TA, Jeje OO. The pathways to the first contact with mental health services among patients with schizophrenia in Lagos, Nigeria. Schizophr Res Treatment 2013;2013:769161. Anderson KK, Fuhrer R, Malla AK. The pathways to mental health care of first-episode psychosis patients: A systematic review. Psychol Med 2010;40:1585-97. Gater R, Goldberg D. Pathways to psychiatric care in South Manchester. Br J Psychiatry 1991;159:90-6.